The ongoing densification of London has seen a vast expansion of residential space, mainly in apartment blocks. Not so in Ordnance Road, in a northern suburb just within the M25. 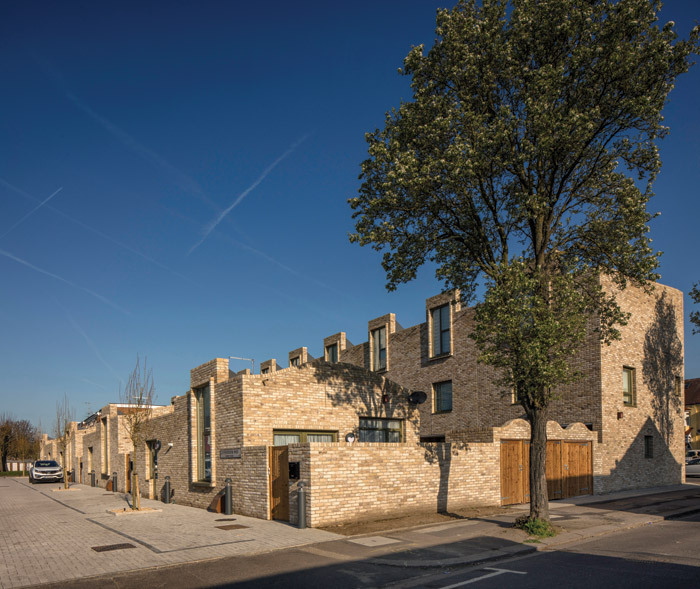 A project there designed by Peter Barber Architects has no flats, but a handsome row of brick townhouses, with some bungalows tucked behind them. The £3m development for the borough of Enfield was completed in late 2018, with all the units offered unfurnished for ‘social rent’. Ordnance Road comprises eleven three-storey townhouses facing the road, and behind them four bungalows on a newly created mews delivered by the development, Sparkbrook Way. This is a reference to the Royal Small Armaments Factory, established 200 years ago on an island at nearby Enfield Lock on the Lee River; the area of Sparkbrook in Birmingham hosted the other factory making Lee-Enfield rifles. The 1,967 sq m site between road and mews is rectangular, which makes a change for the practice — ‘normally we get awkward sites, but this is more regular, street-facing,' comments project architect David Gouldstone, director at Peter Barber Architects. There had been a 1950s pub on the site, and a prefab library, now relocated to a new community centre. Redevelopment gave an opportunity not only to restore the street line, but also answer Enfield’s need for family housing. 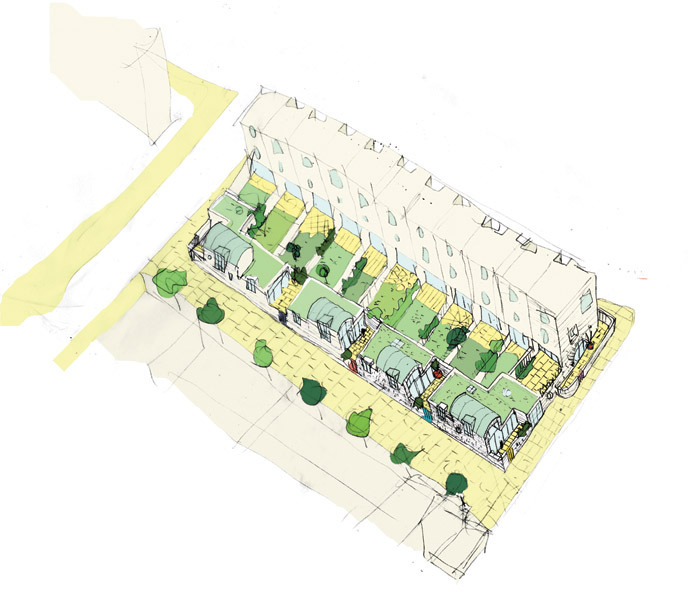 Initial concepts envisioned setting the second and third storey of every alternative house back above front doors, which would be in different poppy colours, as realised in the practice’s Holmes Road Studios (2016) residential development for the homeless in the London borough of Camden. But by the time that was completed and Ordnance Road went on site, the design had evolved. The newbuild delivers a total of 1,365 sq m of floorspace. It is clad in St Ives Cream Rustica bricks, made by Horshambased Wienerberger. Their varying rustic shades of yellow differ from that of the red brick of the neighbouring everyday inter-war suburban terrace housing, but is empathetic to it while lightening the massy presence it brings to the street and brightening the general townscape around it. The houses share no common areas, but form a solid block, with two incisions repeated along the Ordnance Road facade with each house. 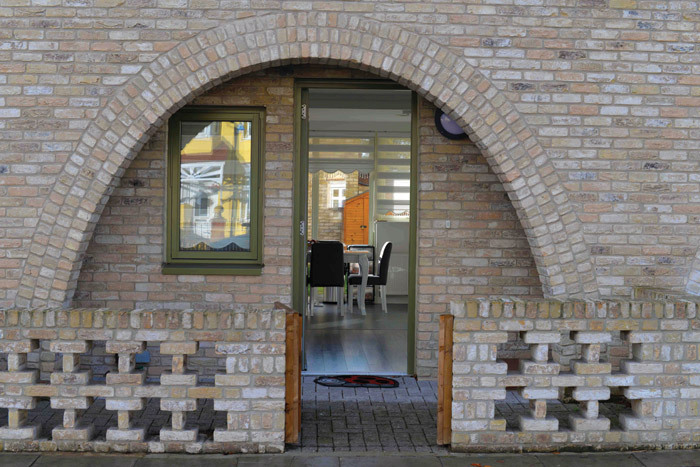 Semi-circular arches create a distinctive identity, and provide recesses for each front door, sheltering it and creating what the architect calls a ‘social threshold’. Above each arch, offset from its apex, is a two-storey vertical indent, providing a first-floor balcony. This arch and indent pattern echoes the practice’s Worland Gardens project (2016) in the London borough of Newham. If the whole block is almost like a massive long brick, it’s not quite a regular one — the roof pitches very slightly down to the south, where large second-storey windows rise above the roofline. Each house’s ground floor hosts a 16 sq m open-plan kitchen-dining room, with full-height, south-facing glazing to harvest the light, looking out over a small patio tucked under the floors above. Beyond it is the property’s garden, as deep as the house itself. The first floor’s balcony is by the stairs. A bathroom is sandwiched between a bedroom and the living room. Climbing to the second floor, there’s natural light from a roof skylight set above the stairs. The northern bedroom has an en-suite bathroom, and the southern one that generous south-facing window. The bungalows are separate structures with gently barrelled roofs. Each is entered through a door beside them in the wall frontage along the new mews, opening into a private courtyard. A single L-shaped room — 34 sq m at each end bungalow and 31 sq m in the two middle ones — combines kitchen, dining and living room functions. There are no windows facing the houses, but each bungalow has two facing the mews, one a huge 2.99m high and 1.47m wide. The single bedroom, which has the smaller window, is also generous — 17 sq m for end bungalows and 14 sq m in-between. All the bungalows are wheelchair friendly, but the end ones meet the highest-level accessibility standard set by Part M building regulations. Sixteen car parking spaces have been created along Sparkbrook Way, which is surfaced as shared space. The parking provision seems out of step with London and urban trends — but demand for parking was a major issue in community consultation. Five trees were felled for the development, but ten added, including eight in the mews. The inherent thermal qualities of brick and a general passive design approach with insulation and air permeability at Ordnance Road result in a good energy performance. Practice founder Peter Barber’s early work was doing small jobs for St Mungo’s homeless charity, and a deep social dimension still characterises his work. Nowadays, his practice has an impressive portfolio dominated by residential projects for London borough councils. Its involvement with Enfield started when it was commissioned to survey three small sites for development for market, which subsequently financed Ordnance Road. This latest project shares much in common with the practice’s other designs which achieve high density with low-rise buildings, and have solid forms and warm materiality which clearly distinguish them from much of the formulaic look of contemporary housing. In the affordable sector, the practice is following in the footsteps of the great Neave Brown, who while working for Camden council demonstrated an alternative to tower-block social housing and the ‘isolation of the slab’, most famously in the Alexandra Road Estate (1972–78). In Peter Barber’s work, there is also a sense of intimacy with the street, and more generally, a belief ‘that architecture can create the potential for social action and activity’ — this quote is from Walter Benjamin, the great German thinker, writing about the vibrancy of Naples in 1924, and it is included in the practice’s manifesto. At Ordnance Road, this is clearest in its arched porches. Standing in them, you are within the envelope of the block, but at the same time separated from the pavement by just a low brick lattice wall — in the same creamy stock as all else in the project. You could stand at your door and chat with someone in the street without leaving the security of the house’s territory. The whole stretch of Ordnance Road will never have the psychogeographical attraction of Naples, but the new houses bring an organic texture and at least a little more of the activity of human life to its street frontage.